Snake Pass is a 1.7 GB, 15 level, extremely well crafted game. Despite the limited amount of levels in Snake Pass I would consider this game a "AAA" title as others like to say. The music in Snake Pass is quite good as I stayed at the main menu listening for about 5 minutes before booting up Snake Pass for the first time. I will tell you - don't worry you can't bite your own tail. I know seeing a snake in a game may cause horrible memories of biting yourself in Snake. Snake Pass has quite a few different controls, but don't worry you will catch on quick as they are very simple. Snake Pass spent much of its production on the graphics of the game, an example would be when you enter then exit water your snake will shimmer on the part or parts that went under the water. This also comes with a downside as Snake Pass lags on occasion due to its graphics unless you buy the overpriced gaming PC or console remakes to play this digital download. In Snake Pass you play across 15 levels and have many things to collect, these things are blue orbs, shapes, and coins. Why you ask, beats me. Some aspects of Snake Pass are slightly unrealistic such as your snake can't drown and can climb on almost anything. The game doesn't stress that you need to slither enough as it tells you once, then expects you to do it all of the time. This is counteracted by the smooth controls in Snake Pass if you remember to grip things while climbing. I can't remember at all, so I will always forget to do it. In Snake Pass you are joined by a humming bird who teaches you how to play and is helpful sometimes when climbing if you start to slip as he will lift you to an extent. I found that Snake Pass can be quite enjoyable when you are doing anything but climbing as I mess up on the buttons all the time, because I am used to more simple controls. You can die in Snake Pass. I tried to jump from one area to another to get the square and I found that out the hard way as I fell off the map to my checkpoint, which resets you to the last time you ran it over(do that often). Snake Pass also offers a time trial mode after you beat level 4 in world one. When you exit the first world in Snake Pass the game gets slightly more confusing as the water physics are a bit different. You have to almost hold dive to stay under due to your snake rising up, constantly. Snake Pass also adds extra s's to words such as ssuperb or fantassstic and so on. Snake Pass is so close to being an example for indie games. It would be if Sumo Digital would have spent more time creating levels. This game could have utilized the systems potentials. Snake Pass is very safe for families as all you do is explore areas as a snake, you don't bite or anything so there is nothing to scare young kids, but Snake Pass doesn't teach anything either. 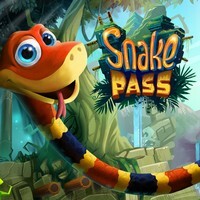 I found this game to be quite enjoyable despite my first thoughts when we received a digital download of Snake Pass on the PS4. This is one of the indie games that I believe should have launched with a physical copy as it has the quality of a Activison or EA game with the graphics that it has. I would say that if Snake Pass gets a physical copy (and it should) then family gamers should look for it as it excludes the despised online multiplayer modes. This also means that not more than one person can play locally at the same time either.